Microsoft unit to fight cybercrime Microsoft Digital Crimes Unit announced the beginning of Operation against botnet Citadel and related cybercrime group. Special operation also includes a campaign to clean up infected by this Trojan computers. The operation is codenamed b54 and implemented by the company together with the FBI, ISP providers and the various CERT teams around the world. The goal is to disrupt coordinated action botnets and attackers who receive financial benefit from them. 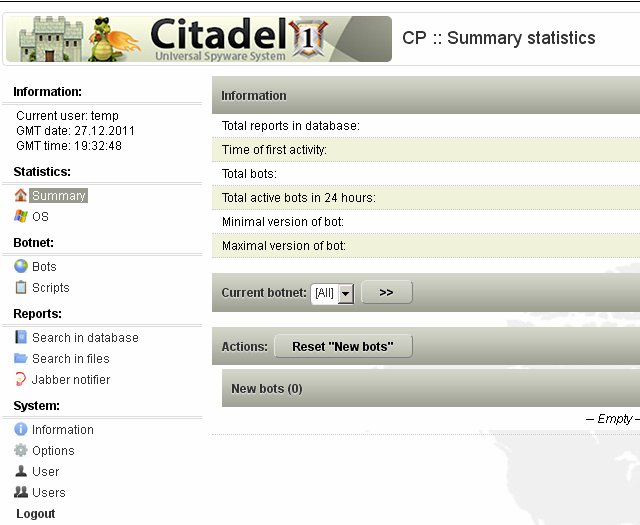 After obtaining a warrant, the company has executed a special operation by disabling more than 1,400 active botnets Citadel, which included the physical removal of the server infrastructure. It is noted that the profit cybercriminals using the Citadel, more than half a billion dollars that were stolen from the accounts of various organizations and individuals with the use of a Trojan Citadel. Suffered about 5 million people, especially vulnerable to the activities of malicious code were the United States, Europe, Hong Kong, Singapore, India and Australia. Malicious code itself is a popular clone of another malicious program – Zeus. Operation to malfunction of the botnet Zeus, MDCU carried out in March 2012 (Operation b71). As in the case of Zeus, this is not a complete elimination of malicious activity Trojan program, but these measures will significantly reduce the activity of the Citadel, and the level of recoverable cash flows, reducing it to the minimum possible threshold value, which ultimately can make a business of cybercriminals too costly and impractical.